E. Hill Turnock was born into an English family that arrived in Elkhart in 1872. As a youth, he began his career as a pattern maker at the Lake Shore and Michigan Railroad. In the late 1880s he moved to Chicago to study architecture under William LeBaron Jenney, and later, he worked with Frank Lloyd Wright. In 1890, Turnock established his own practice, and received commissions in Michigan, Indiana and Illinois. 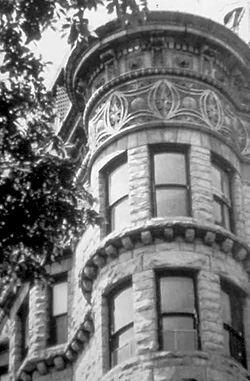 One of his early structures, the Brewster Apartments, is a Chicago landmark. In 1907, he returned to Elkhart and began work on Ruthmere in 1908. He designed many buildings in Elkhart, including private residences, churches, factories, the Masonic Temple, Rice Cemetery, Rice School and the YWCA (now Lexington House). Turnock's style generally reflects a horizontal orientation and emphasis, and he used a variety of materials and styles in his designs. He attempted to bring the design of his buildings into harmony with the site's natural surroundings. Among his influences (and contemporaries) were Chicago Architects Frank Lloyd Wright, Henry Hobson Richardson and Daniel H. Burnham. Many of the buildings Turnock designed in Elkhart are now gone, but a large number remain. Ruthmere is one of the most formal and elaborate of his designs for a private home. 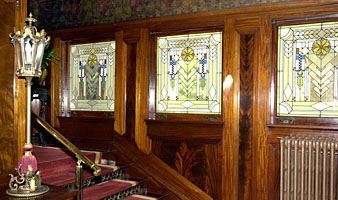 Three Arts & Crafts windows. 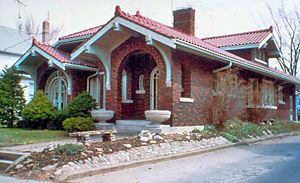 Ruthmere was designed by E. Hill Turnock in an eclectic Beaux Arts style with Prairie School accents. 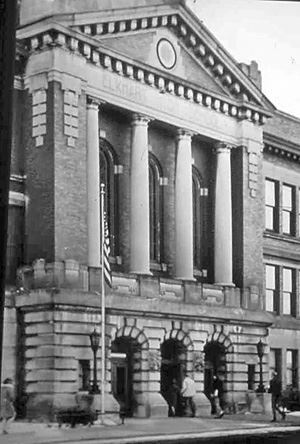 The three-story structure is faced with buff-colored Belden brick from Ohio and native Indiana limestone. Carved stone quoins, capitals, cartouches and window surrounds add exterior interest. The covered entrance is supported by square brick pillars created by carved limestone capitals. 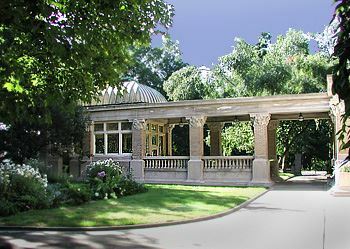 A balustraded marble piazza across the south facade extends to the east side of the building where a porte cochere protects visitors as they arrive by carriage or car. From the east porch a covered walkway leads to a greenhouse.